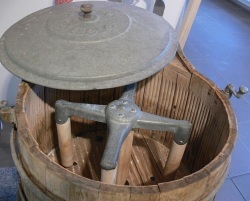 This washing machine from the early 20th century was powered by the latest "high tech" electricity, but the tub was assembled with the age-old methods of traditional coopers who could make watertight buckets from wooden staves. Manufactured by Miele, it's not all that different inside from the very early washing machines of the 1700s. "Machines" with wooden rods for beating and stirring the clothes were popular in Germany for more than a century, while the original inspiration was probably the English washing dolly. The motor is under the tub. 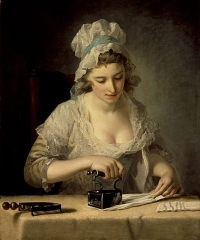 History of laundry - a unique set of pages about laundry methods and tools, including histories of ironing, washboards, starch and bluing. Kitchen antiques directory for the best online resources on culinary equipment, cooking and eating tools. Beds and bedding - featherbeds and bed warmers for comfort, or simple straw mattresses and rustic box beds. One-off pages on topics from brooms to meat screens or hasteners to cleaning with stone and sand. Can we learn from our ancestors about cutting down on waste? "Leftovers" from food production used to supply straw mattresses, footballs, candles and more. I once thought featherbeds were a good example of not wasting any part of an animal reared for meat. 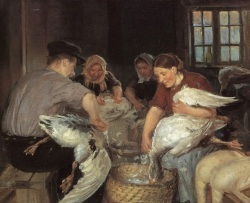 One of my favourite Victorian novelists, George Eliot, implied that the feathers in mattresses, duvets, comforters came from dead geese: "...as for the spare feather-beds.....they were as plentiful as might naturally be expected in a family that had killed its own geese for many generations." But I'm afraid that many living geese had their down "harvested" up to three times a year - painful, and banned today in some countries. Domestic advice expert Maria Rundell was very matter-of-fact about it in 1806: "...old geese may indeed be plucked thrice a year without inconvenience, at an interval of seven weeks." Click for a complete list of all articles arranged by topic. Antique household equipment, furnishings, utensils - housekeeping as part of social history. Domestic life, household management - how people ran their homes and did the daily chores. Yesterday's everyday objects are today's antiques or museum pieces, making us curious about past ways of life. Old & Interesting takes a look at how these everyday things were used, how people managed their home life - and more. Click for RSS feed or email to hear about new articles and blog posts. 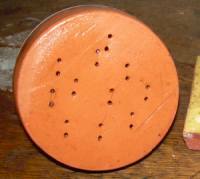 New ~ all about the sulphur matches (brimstone matches) that made striking a light with tinderboxes a little bit easier. Pictures of old matches and match sellers. Washerwomen had a tough life, sometimes working in boiling heat or icy cold. If they were lucky they worked alongside friends. Would it be better or worse to be a high class laundry maid? Would your skills in careful starching and fine ironing of fancy clothing be appreciated? Click on the picture to find out what this was used for. It may be spring in the northern hemisphere but our sister site has been talking about stoves and warmers. Tiled stoves and foot stoves or foot warmers are for cold weather - hand warmers too. And don't forget spoon warmers. Refined sugar used to be a luxury. You may already know about cutting loaf sugar with nippers, but that wasn't all. After cutting a lump, you had to pound it in a mortar and pestle, then sift it. If you wanted sugar for desserts you would "clarify" it: "Put four quarts of water into a preserving-pan, put into it the white of an egg, whisk it well with a whisk till it is a strong froth; put in twelve pounds of sugar, set it over a stove ; when it boils put in a little cold water; let it boil up three or four times, and continue each time to put in a little cold water till the scum rises very thick; take it from the fire, let it settle, then take off the scum, run it through a wet napkin, and keep it for use." (Charlotte Mason's advice in 1777). Each of the books above was chosen to fit in somewhere with our history of housekeeping and household articles theme.